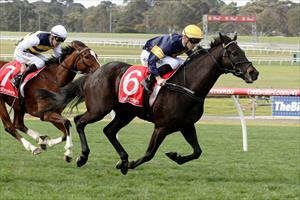 Three runners for the stable at Sandown on Wednesday including last start course winner Mirimar. Mirimar (pictured) runs in race seven, the Benchmark 64 Handicap over 2400m with Stephen Brown reducing his weight to 59.5kg. “The claim gets him in pretty close to his last start and the horses that were placed behind him are in the race again,” Moroney said. “We’re very happy with him, his fitness levels are good and he’s a happy horse. Prince Of Arran is the first to go in race three, the Benchmark 64 Handicap over 1500m with James Winks riding from barrier one. The son of Nadeem finished runner-up at his last start at Sale over 1739m and Moroney has made a gear adjustment. “We changed gear with him and put winkers on him rather than blinkers,” Moroney said. “We felt that last start in the blinkers he was trying to look both sides when he was between horses so the winkers should improve that. “The draw will help him and he should get a lovely run and the firmer track will suit. Meteor Light is in the last race, the Benchmark 70 Handicap over 1800m with Patrick Moloney to ride from barrier five. The import finished third over 1700m at Warrnambool on a heavy track at his last start. “I’m happy to run him but ideally the ground won’t be too firm,” Moroney said. “It’s a solid enough field so he’ll need to be at his best. “He’s a horse that seems to be improving and we’ve made a few little adjustments to the way we’re training him which seems to have helped.